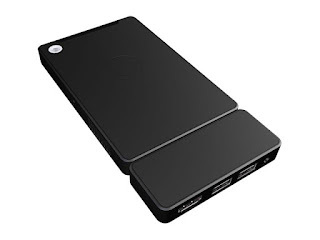 I just picked up the Kangaroo Plus Mobile Desktop PC from InFocus. The standard edition ships with an Intel Atom x5-Z8500 processor, 2GB of RAM, a 32GB SSD and Windows 10 Home for $99. The Plus edition uses the same processor as the standard, but ships with 4GB of RAM, a 64 GB SSD and no OS for $169.99. It also has a fingerprint reader, which is cool, but I don't personally have any use for it. Right out of the box, I hooked the display port on the Kangaroo Plus to my television via the HDMI port. Since it ships with no OS, I had to install one. In order to do that, I used the Rufus tool to make a bootable USB drive out of a Windows 7 iso. The trick here is to make sure to format it using the GPT partition scheme for UEFI as the Kangaroo PC doesn't seem to support booting via MBR. Rufus wants to default to MBR, so make sure you've actually got it on GPT before hitting START. My Windows 7 install kept freezing up on the splash screen when I tried to install it on the Kangraoo. It may have been an issue with my ISO file, it may have been an issue with Kangaroo. I don't know. I used the Windows 10 download tool and downloaded the Windows 10 ISO for Rufus to use. I was able to install Windows 10 on the Kangaroo Plus PC without a problem. Even better, I was able to use the Windows 7 product key in order to activate Windows 10. If I had wanted to, I could have installed Windows 10 using a a Rufus modified microSD card, but I decided that the USB drive would be easier. I tested both the USB 3 and the USB 2 inputs and Kangaroo was able to boot using either of them. Getting the audio to work via the HDMI interface took a little doing. The Kangaroo support site has drivers that you can install to get it working, and the instructions say that you merely update the existing sound driver. But, in my particular instance, there was no sound device listed. I had to attempt to install the drivers against EVERY unknown device listed in the Device Manager in order to get HDMI sound working. Not a huge deal, though. Light Office Work: Microsoft Office 2016 runs fine and web browsing is a breeze, so if you plan on doing things like checking e-mail, writing documents, making presentations, and/or browsing the web, the Kangaroo PC will fit the bill. Thin Client: My organization makes extensive use of virtual desktops, so the first app I installed was VMWare Horizon View. The Kangaroo PC won't even break a sweat when connecting to a virtual desktop, so, that, along with the price ($99 for the standard, $169 for the Kangaroo Plus) makes this an ideal box for such a task. Media Server And/Or Movie Player: My family takes a few vacations a year, and the portability of the Kangraroo PC makes it ideal to bring along to plug into a hotel TV in order to play some movies via VLC for the kids during downtime. Otherwise, I've got it running Plex Media Server while docked at home and connected to a USB hard drive. Home File Server: I've got a bunch of family pictures on a USB hard drive and the Kangaroo PC would be idea to create a share so that the wife can have easy access from her laptop to all the pictures I have taken over the years. Some folks would want to go full NAS rather than file server, but I think making a file share is a better option for folks who don't want to delve too deep into the waters. Old School Gaming Box: Whenever I am feeling nostalgic, I can head on over to GOG.com where I can download one of my favorite old school titles and run her off of the Kangaroo PC. Currently, I'm pushing my way through Fallout and Fallout 2. Next up will be X-Wing and the Quest for Glory series. If you're interested in buying your very own Kangaroo Mobile Desktop, you can find one via The Microsoft Store and Newegg. You might be able to find one via Amazon, but, generally, they are re-sells from private individuals who already bought one and are looking to make an extra profit. You can also buy extra docks in case you're regularly taking your Kangaroo between different locations and don't want to have to bring the dock with you. Kangaroo has an internal battery that should give you about 4 hours of life should you want to keep the machine running while you travel. Also, the battery can be charged via the Micro-USB port.